Trilogy at Vistancia in Peoria, Arizona is an age-restricted active adult enclave in the award-winning Vistancia master-planned community. It caters to buyers with refined tastes for upscale active living in a luxurious resort-style setting. An exquisite level of detail and craftsmanship was built into every aspect of Trilogy. In 2005, Vistancia was awarded the best master-planned community in the country by the National Association of Home Builders. One drive through the community and it is easy to understand why. Stunning views, towering palm trees and lush landscaping make Vistancia seem more like a resort than a neighborhood. The 7,100-acre Vistancia master plan is designed to be an all-encompassing community complete with schools, shopping and recreation. In addition to the age-restricted Trilogy neighborhood, Vistancia is comprised of the family-friendly Vistancia Village and exclusive Blackstone Country Club. Ideally situated north of the 303 transit corridor, residents of Vistancia find the perfect blend of new construction amenities and uncongested roadways combined with easy access to the Phoenix valley's many attractions. Shea Homes designed Trilogy at Vistancia to be uniquely different than other mainstream active adult communities. A delightful array of cutting-edge amenities are available to the residents of Trilogy. 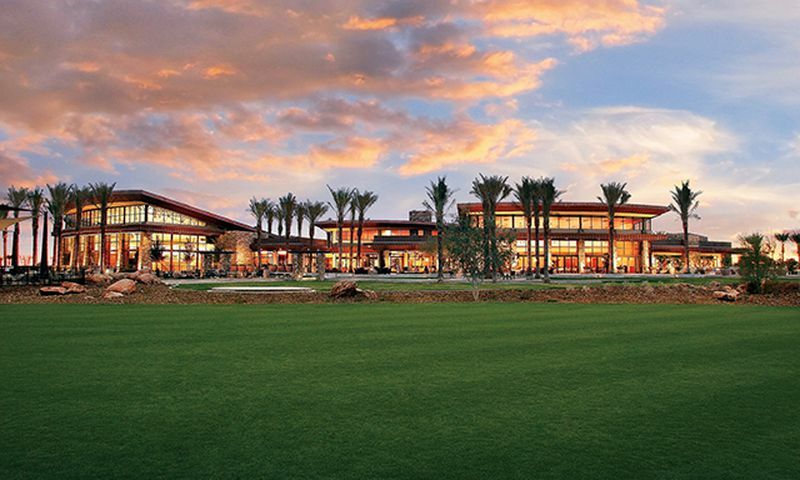 The 35,000 square-foot clubhouse, Kiva Club, is the central hub for all community amenities and social activity. It includes a state-of-the-art fitness center with top-notch weight and cardiovascular equipment. The aerobics and dance studio offers everything from dance classes to Tai Chi and yoga. An indoor lap pool and magnificent resort-style outdoor pool provide panoramic views of the surrounding mountains. Additionally, the Kiva Club hosts hobby studios, multi-purpose rooms, a movie theater, computer lab and library. The community's Center for Higher Learning promotes a variety of continuing education classes such as foreign languages, financial planning and photography. The Alvea Spa at Trilogy at Vistancia is a full-service spa offering all the indulgent treatments of a five-star resort. The spa includes skin care, therapeutic massages, body care, nail care, waxing and tinting. Outside, residents can enjoy tennis courts, bocce ball and the 3.5 mile Discovery Trail that meanders through Vistancia. The Trilogy Golf Club at Vistancia was designed by acclaimed golf course architect Gary Panks. This 7,300-yard, par-72 championship course is unlike any other for playability, shot variety and downright stunning views. It was recently recognized among only 23 other courses in North America as a Golf Digest 5-star award winner. The course flows harmoniously through the Sonoran Desert against a backdrop of breathtaking vistas.The Verde Grill and V's Taproom are ideal spots to relax after a round of golf or spend an evening out with friends. The full-service restaurant offers casual lunches and elegant dinners. Additionally, the Cafe Solaz in the Kiva Club offers gourmet coffee and fresh-fruit smoothies. In 2016, Trilogy at Vistancia opened a second clubhouse, the Mita Club. With 17,000 sq. ft. of space, it offers an even larger aerobic and dance studio and locker rooms than the Kiva Club. Also at the Mita Club, residents will find The Market Place, a great restaurant to find a cup of coffee and discuss current events with friends along with a sandwich or a hot cup of soup, and The Shallow Well, an outdoor bar and grill with delicious drinks and food. The Artisan Craft Studio and Culinary Studio give residents a place to explore their passions or learn about a new hobby. A resort-style pool outdoors completes the clubhouse, along with an expansive patio, two tennis courts, and a small nearby park for relaxing. Trilogy at Vistancia offers many exquisite single-family ranch floor plans that range from 1,218 to over 3,000 square feet. True to Shea's style, the homes are finely appointed with highly desirable features and sought after upgrades. A variety of semi-customizable options are available to homebuyers who want to design their homes to match their lifestyle. Trilogy started construction in 2004 and is planning to build 3,300 residences upon completion. There are currently a variety of pre-owned and new construction homes available. Owning a home inside of the Trilogy neighborhood means having more time to relax and enjoy all of your favorite hobbies. There are many clubs and activities that are scheduled throughout the year sure to meet your interests. If you are sports-minded there are clubs that include softball, tennis, hiking, and biking. More social-related clubhouse include wine club, singles club, coffee club, and more. Activities and groups that meet based on hobbies like crafts, science, and gardening are also popular ways to get to know your neighbors. Around the corner from Trilogy at Vistancia, residents enjoy a burgeoning retail area that offers favorite national stores such as Safeway, Super Target, Kohl's and more. Plus, within a short drive, residents have all the attractions of the Phoenix valley at their fingertips. World-class art museums, cultural attractions and sporting venues are accessible in under an hour. Trilogy at Vistancia is a great community with world-class amenities for Central Arizona's active adult homebuyer. Kiva Club - 35,000 Sq. Ft.
Mita Club - 17,000 Sq. Ft. There are plenty of activities available in Trilogy® at Vistancia. Here is a sample of some of the clubs, activities and classes offered here. The Natura Collection features new and resale homes that range from 1,218 to 2,259 square feet in size. These homes have two or three bedrooms, two or two-and-a-half bathrooms, and an attached two-car garage. The Reflect Collection includes five floor plans ranging in size from 1,392 to 2,080 square feet in size. They include two bedrooms, two bathrooms, and attached two car garages. The Focus Collection offers single-family homes ranging from 1,447 to 1,966 square feet. These floor plans offer two bedrooms, two to two-and-a-half bathrooms and an attached two car garage. The Clarity model also offers a den for extra space. The Veritas Collection features resale single-family homes that range from 1,867 to 2,334 square feet in size. Most homes in the collection feature at least two bedrooms, den options, two or two-and-a-half bathrooms, and an attached garage. The Contour Collection includes three floor plans ranging in size from 2,046 to 2,242 square feet. These homes include two bedrooms, two or two-and-a-half bathrooms, and attached two or three-car garages. The Vision Collection offers single-family homes built by Shea Homes. These models range from 2,046 to 2,851 square feet. All models offer a den for extra space as well as two bedrooms, two to three bathrooms and attached three car garages. The Vignette Collection includes four floor plans ranging in size from 2,401 to 2,717 square feet. They include two or three bedrooms, two-and-a-half or three-and-a-half baths, and attached two or three-car garages. The Vita Collection features resale single-family homes that range from 2,423 to 3,096 square feet in size. Most homes feature two to four bedrooms, two to three-and-a-half bathrooms, and an attached garage. The Viewpoint Collection offers single-family homes built by Trilogy. These new homes range from 2,649 to 3,971 square feet. Most floor plans include a den for extra space as well as three to four bedrooms, three to four-and-a-half bathrooms and a two-and-a-half or three car garage. Prior to choosing Trilogy at Vistancia , we explored a number of retirement communities in the Phoenix area. While each had their pluses and minuses, their own personalities, architectural styles, activities and amenities, something kept drawing us back to Trilogy. Each time we returned and entered the main gate, we got the feeling we were at a resort, not a retirement community. The layout of the roads, the beautiful water features and abundant and interesting landscaping all contributed to this feeling. The Kiva Club, Trilogy at Vistancia's social gathering center, was a wow factor for us. We visited the Kiva Club several times during our initial stay and were impressed with the liveliness of the facility. Various clubs were meeting, the exercise room was being used by residents as was the indoor pool and aerobics classes were in session. Nearby, the tennis and pickle ball courts were full. After having an excellent lunch at the cafe one day, we relaxed at the beautiful outdoor pool and it suddenly hit us. Not only was this an active adult community, which is exactly what we were looking for, it was vibrant active adult community. Everyone we saw on our visit had smiles on their faces and seemed to be having fun. Not only were people living here, they were enjoying living here. We knew then that this was the place for us. We have been on "vacation" for the past 16 months now. That's what it has felt like since we purchased here. The residents in Trilogy are very friendly and we have made many, many friends. Trilogy at Vistancia offers so many clubs and activities such as tennis, pickle ball, bocce, bicycling, hiking, softball, wine club, newcomers group, computer club, genealogy club, STEM club, history club, as well as many arts and crafts, cards and game activities. Trilogy also has a excellent Lifestyle Director who keeps the residents active by planning on-site socials, music, dances, etc., as well as day trips to casinos, concerts, sporting events and trips to other states and countries. Friends and relatives have asked what's it like living in Trilogy and we describe it this way: it's like being on a cruise - you could stay in your cabin and do nothing all day or sit on a deck chair staring at the ocean, or you could try to do all the daily activities the cruise director has planned and go to bed tired. We choose to go to bed tired every night. I constantly rave to my friends and family how fabulous Vistancia is! I always wanted to live somewhere that's just pretty everywhere you look and that's really where I live now. The entire community is just beautiful. The landscaping is constantly being maintained and all the amenities are exceptionally clean and kept-up really well. It's like living at a fancy resort hotel! The pictures on this website are really nice but in person it's even nicer. The Kiva Club is really amazing. I actually enjoy going to the fitness center because of the huge windows. You almost forget you're on a treadmill! Same goes for the indoor pool again with those huge windows you feel like you're outdoors. I don't really have anything but positive things to say about living here, except I wish I would have moved here sooner! 55places.com is not affiliated with the developer(s) or homeowners association of Trilogy® at Vistancia. The information you submit is distributed to a 55places.com Partner Agent, who is a licensed real estate agent. The information regarding Trilogy® at Vistancia has not been verified or approved by the developer or homeowners association. Please verify all information prior to purchasing. 55places.com is not responsible for any errors regarding the information displayed on this website.